Ten granite blocks will surround a statue of Bll Russell, seen here at Harvard in October, for a total of 11 elements — representing his 11 championships with Boston. TORONTO — A statue of Celtics legend Bill Russell, who won 11 NBA championships during his 13 years with the franchise, will be unveiled at 2 p.m. Nov. 1 at Boston’s City Hall Plaza, and a star-studded group of Celtics legends, Hall of Famers, musicians, politicians, and historians is scheduled to attend, as well as Russell himself. TNT analyst Kenny Smith will emcee the event, and Russell will reveal the statue, the Celtics announced Wednesday before their preseason game against the Toronto Raptors at Air Canada Centre. The unveiling takes place the day of the Celtics’ home opener against Milwaukee. Along with Russell, NBA commissioner David Stern, Boston Mayor Thomas Menino, NFL icon Jim Brown, and Basketball Hall of Famers Julius Erving, George Gervin, Elgin Baylor, Charles Barkley, and Clyde Drexler are scheduled to attend. Also on the list are Celtics greats Jo Jo White, Sam Jones, Satch Sanders, and Bill Walton; singers Bill Withers and Johnny Mathis; Pulitzer Prize-winning historian Taylor Branch; Congressman Joseph Kennedy III, and former presidential adviser David Axelrod — among many others. The statue was designed by Somerville-based artist Ann Hirsch in collaboration with the Boston-based landscape architectural firm Pressley Associates and the Boston Art Commission. Ten granite blocks will surround Russell’s statue for a total of 11 elements — representing his 11 championships with Boston. Each plinth will feature a key word and a corresponding quotation from Russell that highlights his accomplishments. But the fact that Russell will be honored with a statue was a long time coming. In fact, in 2011, when President Obama awarded Russell with the Presidential Medal of Freedom, the nation’s highest civilian honor, Obama wondered why the city of Boston didn’t already have a statue of Russell. 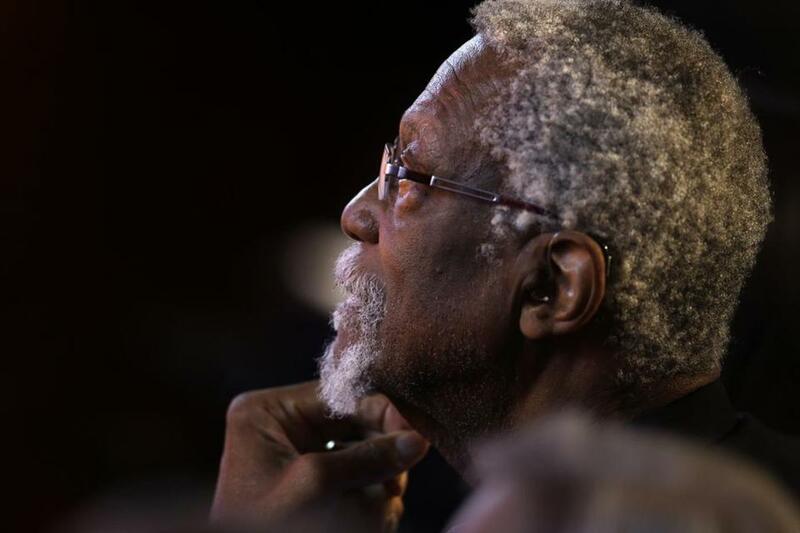 “I hope that one day in the streets of Boston, children will look up at a statue built not only to Bill Russell the player, but Bill Russell the man,” Obama said. Celtics rookie forward Kelly Olynyk was born in Toronto and grew up cheering for the Raptors. Naturally, he was swarmed by Toronto-based media before the Celtics’ 99-97 loss and said he received more than a few ticket requests from friends and family. Olynyk then played his best game of the preseason, with 13 points on 6-of-7 shooting from the floor along with nine rebounds in 26 minutes. “It was special,” Olynyk said. “It felt good to get out there on the court I grew up watching, grew up idolizing. Olynyk also fouled out for the second straight preseason game. Jeff Green, who scored 13 points, grabbed two rebounds, giving him a total of 10 in six preseason games. But Stevens said the way the Celtics want to rebound this year, individual numbers — even for frontline players — won’t necessarily stand out. “What we need to do is rebound by committee,” Stevens said before the game. “For instance, yes there will be times where he’ll have to rebound more, but there’s a great clip [Tuesday] I believe it was Jared, blocking out, and Avery swooping in and getting the ball. Celtics guard Phil Pressey left the game in the second half with a sprained left ankle. His status for Sunday’s preseason game against the Minnesota Timberwolves in Montreal is unclear . . . Rookie center Vitor Faverani scored a preseason-best 13 points on 4-of-8 shooting in 21 minutes. He also grabbed five rebounds and knocked down all four of his free throws, and one of his two 3-point shots . . . For the third straight preseason game, Stevens started Green, Brandon Bass, Jared Sullinger, Jordan Crawford and Avery Bradley . . . Toronto shot 31 of 38 from the free-throw line and the Celtics shot 18 of 22 . . . Raptors guard Terrence Ross scored a game-high 19 points. Baxter Holmes can be reached at baxter.holmes@globe.com Follow him on Twitter @BaxterHolmes.